Bluebird Imaging is a professional photography and imaging studio and gallery. We are located in picturesque Mammoth Lakes, California. 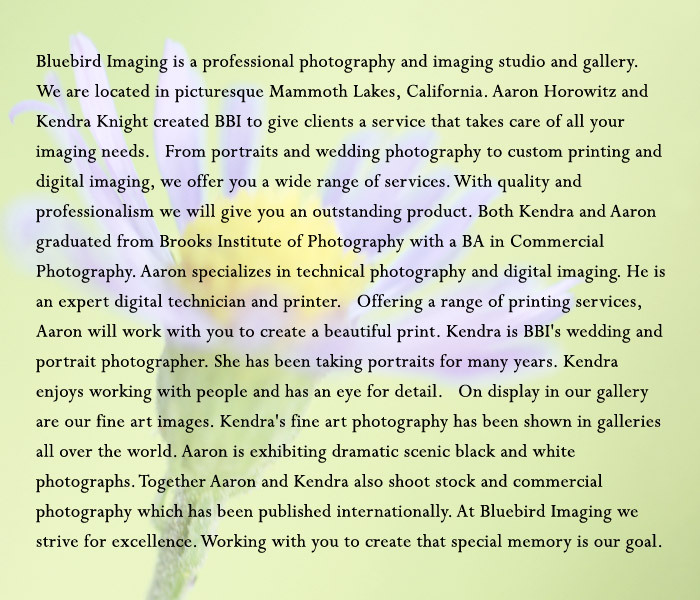 Aaron Horowitz and Kendra Knight created BBI to give clients a service that takes care of all your imaging needs. From portraits and wedding photography to custom printing and digital imaging, we offer you a wide range of services. With quality and professionalism we will give you an outstanding product. Both Kendra and Aaron graduated from Brooks Institute of Photography with a BA in Commercial Photography. Aaron specializes in technical photography and digital imaging. He is an expert digital technician and printer. Offering a range of printing services, Aaron will work with you to create a beautiful print. Kendra is BBI's wedding and portrait photographer. She has been taking portraits for many years. Kendra enjoys working with people and has an eye for detail. On display in our gallery are our fine art images. Kendra's fine art photography has been shown in galleries all over the world. Aaron is exhibiting dramatic scenic black and white photographs. Together Aaron and Kendra also shoot stock and commercial photography which has been published internationally. At Bluebird Imaging we strive for excellence. Working with you to create that special memory is our goal.